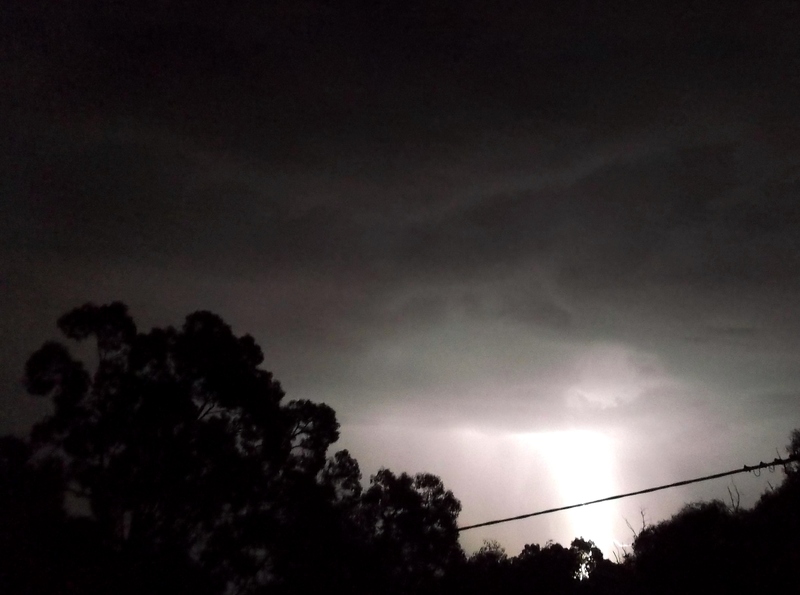 The presence of orbs can be ‘lit up’ by camera flashes (orbs meaning light representations of beings/consciousnesses rather than dust or other particulates in the air), and I’ve realised that lightning can have the same effect, acting like a giant flash bulb. 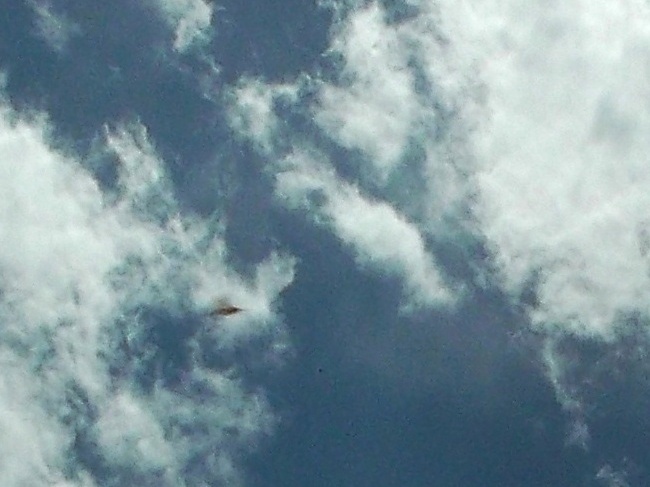 In the photo above, the ‘winged disc’ or crescent/bow shape of the ship is clear, a distinctive shape of ships of the Arcturian angelic and angelic-human peoples, and their close kin, the Alectians (of the star Alcor in the constellation Ursa Major, the Big Bear). In the last two weeks, I’ve attuned closer with this ship and the people on board, captained by Shem’Ash and Aya, who I’ll speak about shortly. To feel their soul vibration and how they have been connected with this planet, let’s first look at the ship’s name, Ahura’Tua. There are common root sounds across the Light Languages of Leonines, Angels, and Carians/High Dragon beings; ‘HU’ is the sound of creation, the vibration of the ‘prime sound/tone’ of life, and ‘RA’ is light, pure Source Light, that reflects and streams from Source through galactic centres, stars, the centre-points of planets, cells, particles, atoms, ions, as the imperishable light/fire of life. ‘A’ as I know it from the leonine language Arua is ‘I’; the I that is Source Self (in Arua, lower case ‘a’ stands for the ‘small self’ or personal identity). 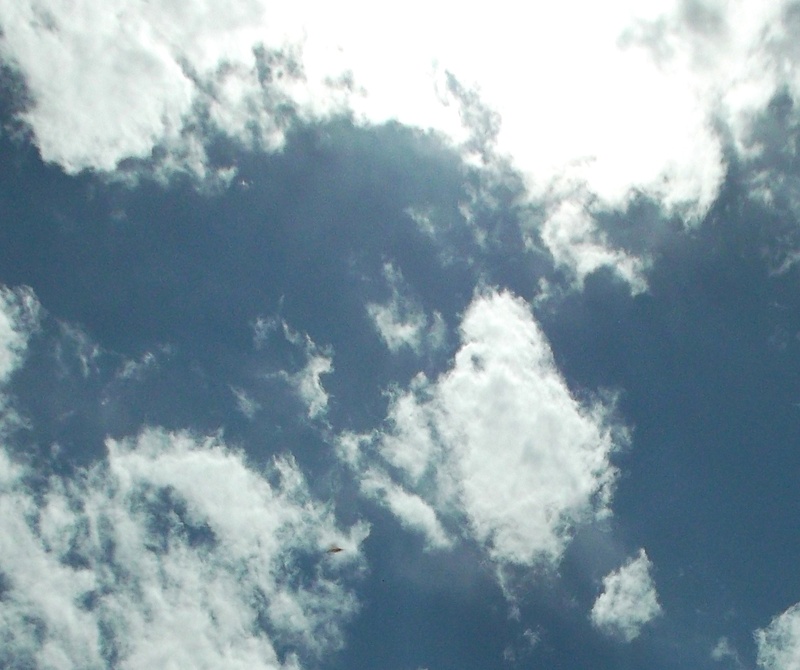 So A-Hu-Ra means literally ‘I-in-Oneness Sound-create Light’ (I Create in Oneness with the Sound & Light of Source). ‘Tua’: TU is the sound of holding, embracing, and lower case ‘a’ is the soul’s focus into a particular aspect or expression, so feel its vibration like that of a baby being held in the arms of its mother, completely relaxed in well-being, pure love, encircled and embraced. Thus, Ahura’Tua reads as ‘I Create (with) Divine Light-Sound within and through the loving embrace of Source (bow/arc/crescent)’. It is also a vibration of those who fly through the Sun (higher dimensional solar portal), as Ahu means BEing of the Sun, so Ahu’Ra is also Sun Being of the Divine Light…the Ahura as souls who come from the Galactic Central Sun. On asking how Ahura’Tua would translate as an Earth word, Shem’Ash and Aya gave the word ‘Ararat’. I first saw an image of Mt. Ararat, upon which, in biblical stories, Noah’s Ark came to rest (if you feel the relation of Ark > arc > Ark Angels). Ararat is also a region, in the current era spanning from Turkey into Iran, in ancient times known as Urartu. One of Urartu’s ‘Sun gods’ was named Shivini, which was rendered as Shamash in Assyrian, and his consort was the goddess Aya. Aya means ‘dawn’ and Shamash means ‘the rising sun’ (refer back to this previous post about Syria and Japan as lands of the rising sun, to see the connecting threads). Shamash was identified with the quality of justice, and specifically with bringing hidden injustices to light – a peaking energy at this time on planet Earth. Shamash, stone frieze, Palmyra, Syria. 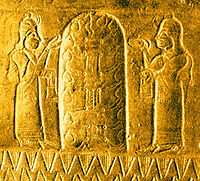 Life in balance: masculine and feminine water the Tree of Life, helmet engraving, Urartu. ‘Shem’ in Arua (leonine language) means Light, as in sacred/divine Light – and Shamash was also sometimes depicted as a lion. ‘Ash’ has many layers of meaning, but here I will speak of Asha as it was understood in the time of the Ahuras (the good/virtuous angels/gods in the ancient Middle East). 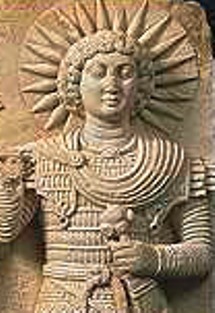 The Zoroastrian texts of ancient Persia spoke of ‘Asha’ as ‘that which is Truth’, the truth of God (named Ahura Mazda, a merge of masculine Ahura ‘god’ and feminine Mazda ‘wise’), the first principle of creation, and also as reality, in the sense of that which is true being real (ie; the higher the truth, the higher the degree of reality). ‘Ahura’ dates back to about 2000BC in the Middle East, along with a counter energy, ‘daeva’, which were seen as ‘gods of lies’, beings who gave false counsel, to be avoided. These words have the same etymology as ‘asura’ and ‘deva’ in the Indian Rig Veda; in the oldest layer of the Rig, dating 1300-1200BC, asura meant all gods. Later on, in a reverse polarity of the older Iranian/Middle Eastern and early Rig Veda views, ‘deva’ became good gods and the ‘asura’ became negative gods/demons. This reversal spread through Asia – to go into the deeper meaning/history of this is beyond the scope of this post, but see this related post. Shem’Ash and Aya are angelic beings with a leonine blending, in the vibration/energy of new beginnings, dawn of truth, era of ethics, the rising Light of Ra: A Hu Ra. Asha is an ancient Angelic House, which later merged with the Ara (leonine house) as one whole…along with all the old Houses now beyond conflicts and unified within the Intergalactic Confederation. Here are the most recent photos of the Ahura’Tua, taken on Sunday, October 11, 2015. I felt them to the north, and to look for a ‘V’ shape in the clouds, which the ship was near. 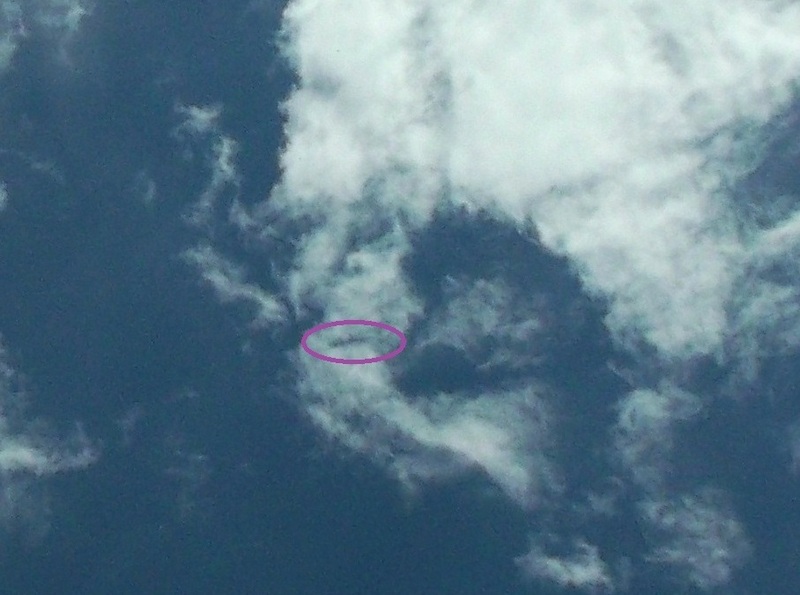 ‘V’ shapes in upper and lower clouds, ship lower left, Oct. 11, 2015. 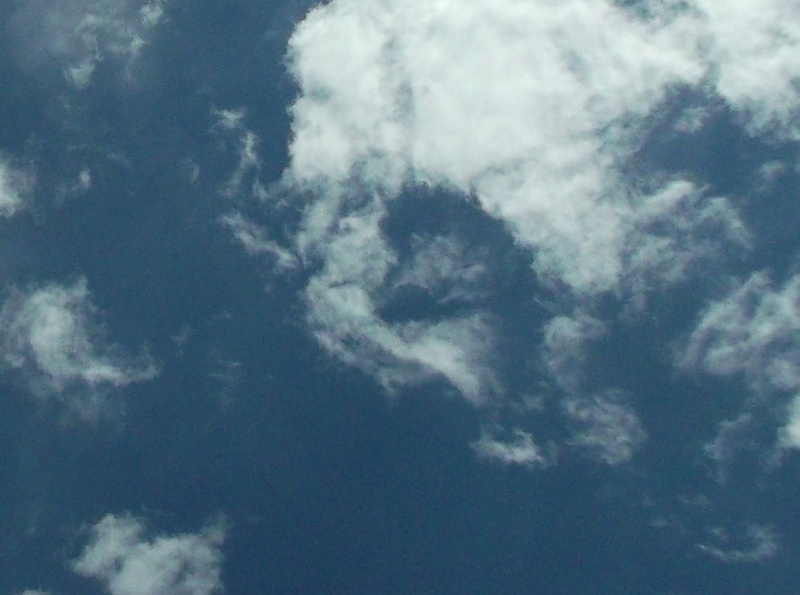 The Ahura’Tua is in the lower left cloud, partially behind the clouds with its right wingtip uncovered. Below, I’ve shown the angle of the cloud ‘V’s and the ship, which I’ll return to in a post about higher vibrational geometries. Angles of the ‘V’s and ship’s placement shown. 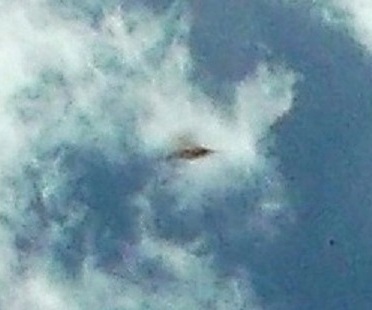 In close-up, the shape of the Ahura’Tua is visible, despite the ship being ‘cloaked’ (it’s uncloaked appearance is bright silver with a golden disc on the ‘roof’). It’s wonderful that they are able to reveal themselves to at least this extent now. The dawn is getting closer…. Extreme close-up, showing ship’s bow shape, pointed tips and slight dip at the centre front (prow). The Ahura’Tua then moved south, and appeared in this photo behind a cloud which formed into a perfect semi-circle and crossbar shape, bird in flight, or bow & arrow. 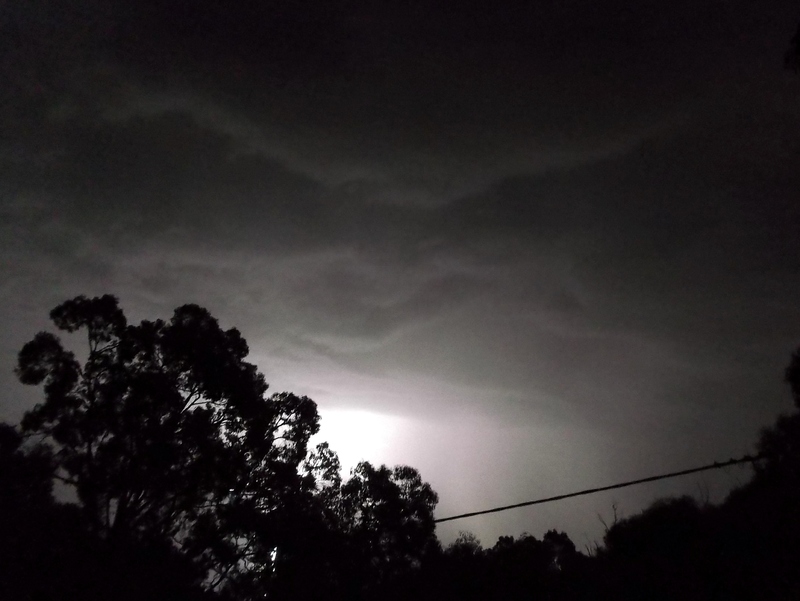 Ahura’Tua behind cloud to the left of ‘bow and arrow’ shape in the clouds. The Arrow through the Bow: “I create with Light-Sound within and through the encircling Arch.” And so it is. By the way, the bow/arc shaped ships of the Arcturians were seen and documented by an American man, Kenneth Arnold, in 1947. Accurate pictures of the ships, based on his descriptions, were published in newspaper articles, before being suppressed again. In the opening image of the video below, the ship on the left which is silver, with a gold disc, and slightly dipped front is exactly like the Ahura’Tua (subtle hint). 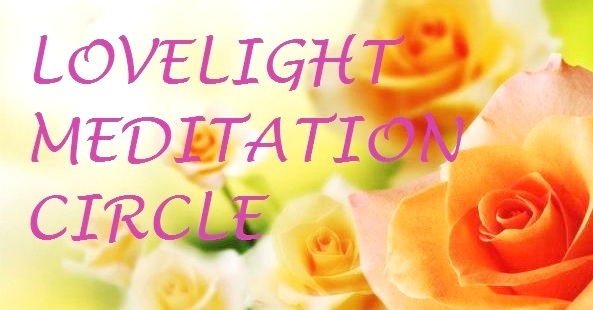 Welcome to the dawning of re-freshed cocreation with Gaia, soul brothers, sisters and cousins. With thanks to our star families, inner Earth people, human anchors on the ground, elementals of this planet, dolphins and whale beings, and all who devote themselves to birthing and uplifting together in this Now. I just read the lines below in another post, and will leave them with you…though in Truth, there is no ‘leaving’. 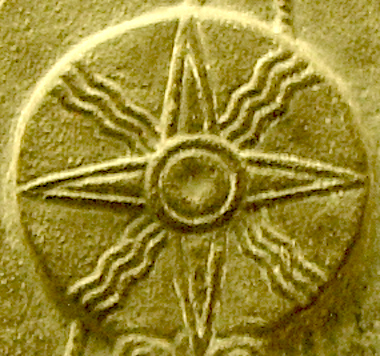 The Star of Shamash (in the Temple of Shamash, Sippar, Iraq, 860-840BC.